Tibo, which translates to “lesbian” in Tagalog (or more pointedly, Filipino butch or masculine-presenting lesbians) has defined a world of storied beings for me, ever since I was a curious probinsyana baby dyke back in the Philippines. Tibo is the hushed word you’d hear between whispers, whenever a woman donning men’s clothing (whatever that means) passes by, sporting that siete cut as if to give the notion of dalagang Filipina a middle finger. Tibo is also the word I struggled with growing up, never really comfortable with a word that is simultaneously used as a pejorative or an endearing term, depending on who says it. These were heavy on my mind as I watched a show in San Francisco last week, at Bindlestiff Studio. The show was called MEMORYA, an intergenerational dialogue of queer Pin@y elders and emerging artists through storytelling, poetry, dance and performance. It was put on by a queer Pin@y performance arts collective called Kreatibo, a portmanteau for “creative” and you guessed it - tibo. I was sitting on the front row, giddy in my seat. Soon enough, the lights dimmed and a figure walked on stage. It was Trinity Ordoña, a queer Pin@y elder and legend to my 17-year old self. Kreatibo was formed back in 2003, a year before I migrated to the U.S. They performed sold-out productions in the city, even garnering Curve Magazine’s annual Lesbian Theater Award. At around the same time back in the Philippines, my English professor and mentor, Ms. Lucilyn Magbag handed me a book that forever changed my life: TiboK: Heartbeat of the Filipino Lesbian (tibok translates to heartbeat in Tagalog - see what they did there?!). The anthology was a collection of poems, fiction and nonfiction stories, comics and recipes written for and by Filipino lesbians around the world. It was all about women loving up on women. There were stories like “Butch, Butcher, Butchest,” even a story about a puki bird. One of the writers whose story stuck with me was a nonfiction piece, a story about identity, finding home and family. It was Trinity’s. So there I was, bowled over by the fact that the writer from TiboK opened up Kreatibo’s show. She was right in front of me, as my head swirled with my own memories and the familiarity of her story because I’ve also committed it to memorya. More than a decade later, this merging of a younger self, literature and Trinity live-in-the-flesh in a theater that nurtures Filipino-American artists felt like an affirmation, a warm arrival. TiboK is still my go-to to this day, although I’ve added many more titles to my queer book arsenal. I feel lucky to live at the moment, to be a witness to the world/s created by queer writers in between pages. How the loads we’ve carried have now found homes in book spines, and we can now revel in the stories of queer people, specially queer and trans people of color, breathing and struggling and laughing and surviving and loving the way all of us do. AINTH is the novel I’ve been waiting for my whole life tbh, because it’s about everything I care about - queerness, migration, family and pancit. Written by Bay Area native Elaine Castillo, the book is a compelling read on the lives of Filipinos in the diaspora post-martial law. You got your Filipino DJs, your barkada, you healer-lola, house parties in the City but most of all, achingly tender bonds between the families you make. From one of the co-founders of Black Lives Matter comes a searing memoir, an intimate portrayal of many opposing forces — of poverty and abundance, of pain and resilience, of violence at the hands of the police and the depth of love within families and communities. Patrisse Cullors’s book is the story of a queer black woman, the story of a survivor, of a daughter and a sister whose strength carried her family beyond the most harrowing experiences at the hands of the state. 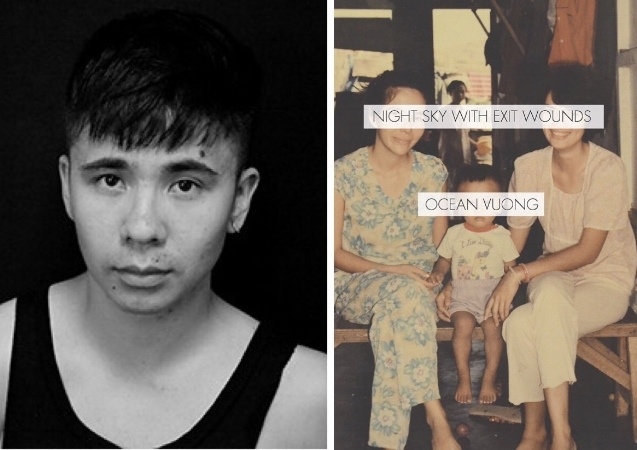 In Night Sky with Exit Wounds, Ocean Vuong carries the stories of his parents seeking refuge away from Hanoi. His father is a constant subject, navigating political and emotional terrains. The queer poet from Vietnam writes poems that are brimming with elegiac elegance, the kind that makes you want to know more but you stop short of asking, almost fearful of the answer(s). As poet Li-Young Lee states: What a treasure [Ocean Vuong] is to us. What a perfume he’s crushed and rendered of his heart and soul. What a gift this book is. The short story collection from the brilliant queer Latinx Carmen Maria Machado carries a concise but weighty voice, one that tells the stories but keeps other details hidden. It is both what she is and what she isn’t saying that drew me even closer to the text, a pull impossible to resist. It’s also in the way she writes about the feminine and the body, the way she memorializes each emotion that stuns me. Machado is also able to capture the beauty and sanctity of queer, brown love, something that resonated so strongly with me (and with all the other QTPOC people I know) with this collection. Radical Dharma discusses and disrupts the mostly white spaces in Buddhist communities, and infuses their experiences as queer black beings as authentic embodiment. Incorporating healing work around trauma, challenging spaces where their blackness and/or queerness are erased and their personal experiences, Rev. angel, Lama Rod and Jasmine are creating the kinds of spiritual communities that uplift even those shadowy parts of ourselves in light, love and healing.